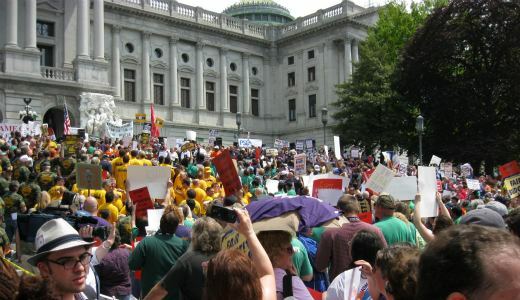 HARRISBURG, Pa. – Thousands of union members, education advocates and their allies packed the steps in front of the state Capitol May 3 to demand that Republican Gov. Tom Corbett humanize his budget proposals and stop his crusade to balance the Keystone State’s budget on the backs of its workers and its most vulnerable citizens. Chants of “We are one” and “These cuts are nuts” rose from the spirited crowd as the rally began. 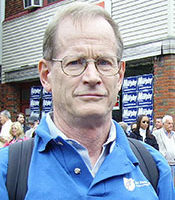 The rally was part of an ambitious day of action organized by CLEAR (Coalition for Labor Engagement and Accountable Revenues), a statewide grouping of AFL-CIO and independent unions, Working America and allies. Participants visited legislators before and after the rally to urge them to enact a fair budget rather than go along with the draconian cuts the governor has proposed. Participants at the rally heard speakers from many unions and community organizations call for a fair budget and the closing of corporate tax loopholes. The governor’s proposed budget threatens to devastate the educational programs in school districts across the state. Demonstrators in the crowd told this reporter what the cuts would mean for their school districts. Tara Reis, a parent from the Woodland Hills school district near Pittsburgh, said “We came here in support of public education.” Karen Marron, a teacher in the same district, said that her entire Family and Consumer Science Department, as well as French and others, could be eliminated entirely and that her job was on the line. Corbett’s proposals would slash approximately 50 percent of the budget of the network of 14 state universities and over $1 billion from the state’s share of public education funding. He has proposed that universities make up the difference by allowing corporations to drill for natural gas on their campuses. 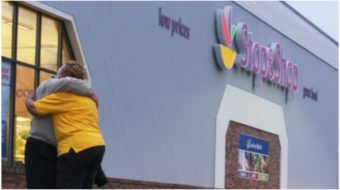 Corporations have been rushing to secure a share of the profits to be gained from drilling in the Marcellus shale region, which includes much of the territory in northern, central and western Pennsylvania. The governor has so far resisted calls to tax this growing and lucrative enterprise, and press reports have noted his relationship to oil and gas interests who were major donors to his gubernatorial campaign. The afternoon rally included mineworkers, steelworkers, city and state employees, teachers and other education workers, transport workers, service employees and sheetmetal workers as well as parents, other supporters of public education and members of Working America.